The Migration Museum provides a rich overview of the social history of South Australia. It was founded in 1986 is dedicated to conserving the diverse history of immigration and settlement in Australia. There are several permanent and visiting exhibits. The nine galleries in the museum provide an in depth look into the life of the Aboriginals pre and post immigration and the life and culture of the various people that eventually came to call Australia home. It is housed in what was formerly the Adelaide Destitute Asylum and prior to that a “Native School” for aboriginal children. Entry to the museum is free and a voluntary donation can be made. Guided tours can be booked in advance. Wheelchair access is available to most of the Museum’s displays. Guided tours must have a minimum of ten people and must be booked and paid for in advance. How popular is Migration Museum? People normally club together Art Gallery Of South Australia and National Wine Centre Of Australia while planning their visit to Migration Museum. A free museum that is informative and thought provoking. The exhibits are interactive, really well thought out, and change every so often so you see new things everytime you go. I recommend everyone who visits Adelaide (or lives here) to see it! A great museum with wonderful and extraordinary stories. This is museum of people whom are wasn't success to rich Australia as well .I have a visit with my son and remained him that he is one of immigration nation. 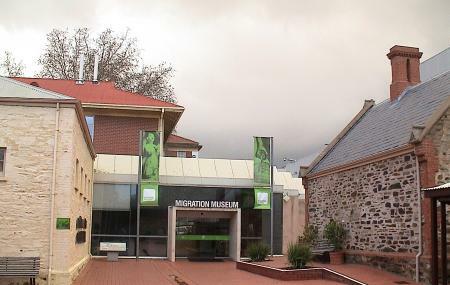 A museum about migration in Australia. Well presented and interesting, if you like history. Entry is by donation. The migration museum does a really good job at showing the history of where immigrants have come from during different periods of time, how our policies have changed towards immigrants over the years, and how the cultures brought into Australia influenced our nation to make it the multicultural society it is today. Great effort was made to set this museum up, and the entry fee is small. Toilet facilities are available. This a very insightful point of attraction for people from all walks of life as the exhibits detail many reasons for immigration. The souvenirs section touches on objects that incite feelings of nostalgia while the latter part of the museum goes through the period of colonisation and beyond. I also thoroughly enjoyed the outer building that goes through the history of the buildings when they used to be lying in homes for women young and old. Children will love the interactive displays while adults immerse themselves in this history of migration both locally and domestically.